(Central Islip, N.Y., March 20, 2018) – The Long Island Ducks today announced the signing of right-handed pitcher Matt Marsh. He will begin his second season with the Ducks and fifth in professional baseball. 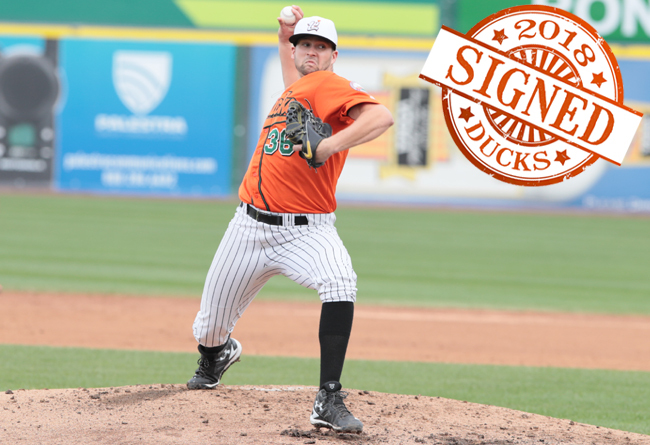 Marsh joined the Ducks in August of 2017 and made seven consecutive appearances without yielding an earned run, including six scoreless outings to begin his Ducks career. Overall, he compiled a 2.45 ERA and 23 strikeouts to just six walks over 18 and one-third innings of work in the regular season. The Tennessee native also appeared in three postseason games, including a perfect seventh inning during Game Four of the Liberty Division Championship Series against the Somerset Patriots. The performance helped the Flock clinch their fifth Division Championship in seven years. Prior to joining Long Island, the 26-year-old spent parts of four seasons in the New York Yankees organization, reaching as high as Double-A. In 84 appearances (eight starts), he accrued a 13-9 record with a 2.42 ERA, two complete games, eight saves and 186 strikeouts over 175 innings. The Liberty University alum pitched in 15 games between Advanced-A Tampa and Double-A Trenton in 2017 before joining the Ducks and went 3-2 with a 2.49 ERA and 28 strikeouts in 21 and two-thirds innings. Marsh was originally signed by the Yankees as an undrafted free agent in 2014.